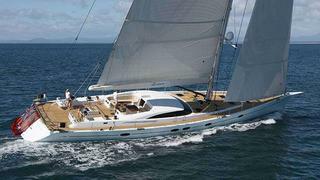 The 32 metre sailing yacht Liara has been listed for sale by Tim Langmead at Camper & Nicholsons. Built in carbon composite by the Southern Ocean Shipyard to a design by Bill Dixon, she is RINA classed and MCA compliant with delivery in 2009 and a major refit in 2014. The refit included new paint on the hull and superstructure, a new mast and standing rigging plus a full refurbishment of her interior joinery from bow to stern. Accommodation is for nine guests in three cabins. The master suite is forward with a queen size double bed to starboard and one large single bed to port with internal sprung 180mm mattresses. To port, the double guest cabin has ample storage including cedar backed hanging lockers and pull out drawers. A twin cabin to starboard benefits from similar storage to the double guest cabin. This cabin has the added benefit of two additional pipe cot berths that can be easily set to cater for four in comfort. In addition, all cabins have en suite bathroom facilities. Liara's versatile accommodation makes her the perfect choice not only for racing enthusiasts but also for families who want to cruise on board a pedigree vessel. Under power, a 305hp Cummins engine gives her a cruising speed of 13 knots. Currently cruising in the Caribbean, Liara is asking €5,495,000.